Independent TD Michael Fitzmaurice said politicians need to bring in legislation to make sure recent incidents are not repeated. MORE THAN A thousand people have attended a protest at Strokestown in Co Roscommon calling for an end to forced evictions. The demonstration follows the eviction of a local family by private security staff in recent weeks. After the eviction, a large group of people stormed the house and ejected the security staff. Three people required hospital treatment after the incident and a security dog suffered injuries and had to be put down. Two men have since been arrested in connection with this incident. They were released without charge and a file is being prepared for the Director of Public Prosecutions. Shannonside FM reports that between 1,000 and 1,500 people have gathered at the protest in Strokestown this afternoon. “We have to make sure that every alternative is there for families to be always given the chance to stay in their homes,” local independent TD Michael Fitzmaurice told the crowd. 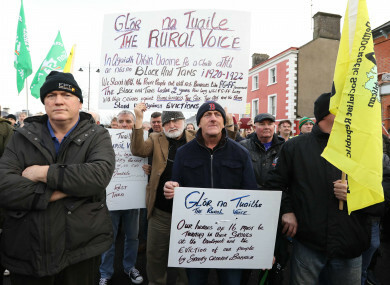 Email “'Give families a chance to stay in their homes': Hundreds attend anti-eviction protest in Roscommon”. Feedback on “'Give families a chance to stay in their homes': Hundreds attend anti-eviction protest in Roscommon”.